The Wily Bomber is trying to blow a safe, but the vigilant Safe Guard is ready to catch the bombs. 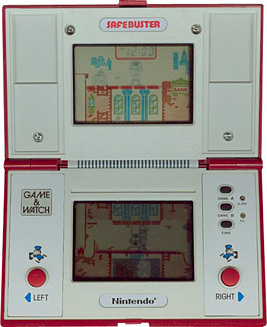 Wily Bomber appears on the top screen, moving left and right, dropping bombs. Move the guard left and right on the bottom screen to catch up to three bombs in the container. Empty the container on the left or right sides of the screen. If you empty enough bombs on the left, flaming torches will fire up into the air and ignite the Wily Bomber's stash of bombs for 20 bonus points. You score 1 point for every bomb you catch. When the Wily Bomber's bombs explode you score a 20 point bonus. Catch the bombs and pour them off the left or right hand side of the screen. The cover on the left opens for five seconds and closes for one second repeatedly. Time emptying the vessel so you can pour the bombs into it.